ISAP is a Section 21 Namibia Non Profit NGO that aims to combat poaching through creating awareness and gathering information (Intelligence), from various platforms, in support of the Namibian authorities. Once gained, information is collated and processed into intelligence, it is passed on to the likes of the Ministry of Environment & Tourism (MET), Namibian Police Protected Resource Division or any other authority or organization, which has anti-poaching as part of its objectives. To establish a national ground and air quick reaction capability (airborne control and coordination to ground forces by means of Radio / mobile & Sat phone communication), in the event of major poaching incidents, search & rescue, conservation needs, air surveillance and crime prevention. This project aims to support commercial famers, private reserves, government authorities and any other organization / area, which may require a coordinated ground and air support capability. Essentially this would lead to the formation of Private Public Partnerships, which ISAP sees as a key element to fighting all forms of environmental crimes. Main focus would be on anti poaching or reacting to poaching incidents, it however makes sense to cater for other incidents (as listed above), as this gives the project better critical mass and ensures better sustainability. 3.Procure required equipment and transportation needs. 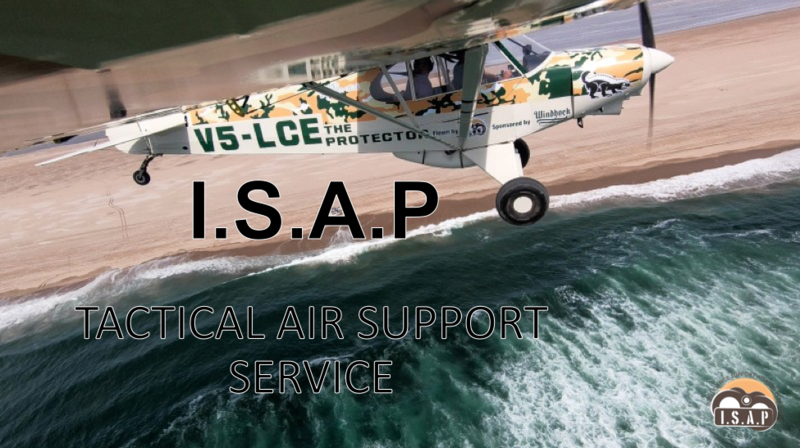 ISAP Air support services will consist of a TOC based in Windhoek at Eros Airport. The Center must be fully equipped to facilitate Planning, deployment, mission control, navigation, logistics support and airborne command & control, and will be manned by volunteer pilots. 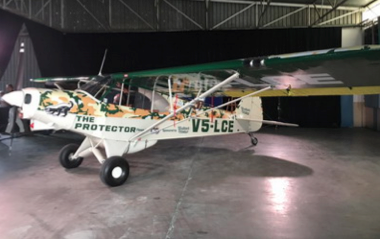 Command & control will be provided via our PA-18 Super Cub, equipped with Radios (Ground to air / Air to farmer 2 way radio networks etc. ), satellite telephonic communications and GPS. For extended and away from base operations, the aircraft will be supported by our Mobile Support (MS) platform. Once a incident is reported to the ISAP TOC, reference is made to the regional list of GF’s contact numbers, ensuring speedy response and reaction to the incident from closest located GF’s. Should the area requiring support be placed to far away for practical deployment of ISAP aircraft, the national database of aerial assets will be checked to see where closest air support would be available. Together with a coordinated approach by local GF this will greatly reduces response time to incidents, will ensure good coordination on the ground resulting in a far more effective ability to apprehend poachers, before they can escape OR COMMIT THE CRIME!! The MS will be a 4x4 vehicle fully equipped to travel anywhere in Namibia, to fulfill the roll of a mobile TOC, manned by two persons. Equipment would include all communications, ground support and additional aircraft fuel and other equipment for multi day deployment. It is responsible for all logistics backup needed by the AC and its crew. Currently ISAP is busy soliciting funding trough several funding organizations in Europe. To this end ISAP has sent various proposals to funding organizations, facilitated by ISAP partners residing in Europe. This would include, amongst others European Hunting organizations and several large manufacturing and retail organizations. ISAP has also commenced with our International Volunteer Program with the aim of establishing self-funding initiatives; this program is well under way with the volunteer training facility already being constructed on a private nature reserve adjacent to Erindi Reserve (www.isap.com.na/volunteers/). Additional self-funding programs are also under development in conjunction with Namibia Breweries Ltd, with whom ISAP has signed a MoU to foster close partnership going forward. ISAP presented this project to leaders of industry, key Government persons and other stakeholders, on the 14th August 2018. Procure required equipment and transportation needs. This will be dependant on funding outcomes. Database is currently being established with the assistance of the Namibia Agriculture Union (NAU). ISAP has been at the forefront of developing and presenting a framework for farmer safety and protection, which has been presented to regional farmers unions by ISAP members, through this process a extensive network of contacts has been developed which will greatly assist with the national database, as well as keeping the database current in the future. ISAP is putting the list of key GF contacts together with the assistance of MET and Nampol (Regional Commanders). This again will be kept current with quarterly review meeting with Government authorities, a process which is already underway. ISAP offices are currently located within the MET head office, which provides easy access to key persons. Already underway through the collaboration of ISAP and the NAU and the presence of ISAP at regional farmers meetings, also our location within the MET head quarters provides good sustainability for communication and coordination. This is being developed in collaboration with MET and Nampol and will be distributed through NAU forums and regular meetings between ISAP and Government authorities. At this stage ISAP is in discussions with several organizations located at Eros Airport, which may have space availability to accommodate the ISAP TOC. Already in process through NAU and Government partners. Role out 2018 / 2019 based on availability of funding. From the onset to completion, the project monitoring and evaluation will be conducted by the project team leader (D Francis) and project coordinator (T Hansen), utilizing the attached project schedule, which will include essential date, “stakes in the ground”. As this project is not a once off event, rather an ongoing national strategy, this will ensure sustainability through buy in from the various stakeholders. Once the benefits are demonstrated in the actual role out and implementation, further strategies OR Private Public Partnerships will evolve, building on this platform and furthering the attractiveness of this to local and foreign funding partners. ISAP as part of its daily efforts, continually seeks to attain new funding partners as well as building on current partnerships. ISAP is a relatively new organization, which has see rapid growth in terms of its Brand value and awareness! Solid partnerships and working relationships have been built over the last three years with the Namibian Government authorities, testimony to this is the granting of office space by the Minister to ISAP in the new MET building. ISAP in terms of “sustainable partnerships” have a concluded MoU agreement with Namibia Breweries Ltd, and is currently well advanced in the process of concluding MoU agreements with the Namibia Police and MET.